Lots of visitors last night (this morning), I presume the reason to this is the previous post about the WotLK alpha talents. Well it's all good, feel free to spread the url on your guild forums, blog or just tell your friends. It'll be fun to see if we can hit 4K page views for once. 3 March we got it up to 3980, so close. Historical records only exist to be broken, as such we'll get that number sometime or other. Do you remember this post? Well, it looks like today is the day. Be sure to head over and give your opinion on the new theme. Some corrections have been added to this page since yesterday's news. * Improved Icebound Fortitude, is obviously a Death Knight spell. * A Warlock Talent tree has been set up, as has a Druid, Warrior and two different ones for Mages. Obviously these are _not_ real, but they give ample room for slightly more realistic speculations than before. * Most of the images in the previous post are still working, so be sure to check those out while they're hot and ready. Blizzard has released two new pages of information regarding the new Death Knight class, and gameplay. 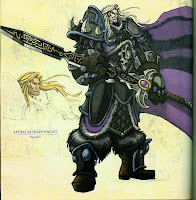 Class roles for the DK were already known and are basically the same as Paladins, warriors or Druids. Tank / DPS depending on your talent trees. A knight also seems to have a "Presence" which is described much like a paladin aura. The three presences are Blood, Frost and Unholy. You inscribe upon your weapon any combination of 6 runes. 3 Blood, 1 Frost, 2 Blood. Or 6 Blood, Or 6 Frost. Whatever you fancy. Each ability you use will require / deplete a set number of combination of runes and thus regulate your maximum DPS or threat output much like warriors are limited by rage, paladins by mana, and rogues by energy. Each time a rune is used it gets a 10 second cooldown. Most interesting is the ability to summon minions. * Raise Dead, much like the old Diablo II Necromancer class. The coolest feature is that you can cast this on friendly players. Who will then become your little pet ghoul for the duration. * Army of the Dead, much like Baron Rivendare summons. These are limited time minions and the spell is channeled. Should produce quite a comedic effect however. * Summon Deathcharger, your mount. At level 60 there will be an epic quest which allows you to upgrade this spell. As stated Blizzard released new info regarding gameplay as well. Heroic dungeons will be back, and are likely to use a new form of token. Don't expect to hoard up 500 Badge of Justice and spend those on WotLK gear. A new type of badge will be added and new rewards for them as well. Attunements and dungeon locking will still exist, according to Blizzard however you won't need to do any attunements for a 10 man dungeon in order to get attuned to a 25 man dungeon. Each 25 man dungeon will also have a 10 man version in WotLK, with lower quality loot and easier bosses. Lockouts will be individual, so you'd be able to do spire 25 man, and spire 10 man in the same day. Hopefully this mechanic will mean there will be less frustration about attuning players for higher end raids. Much like the Vials of eternity and Black Temple attunement quests currently. 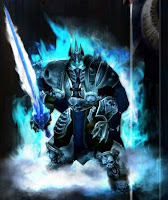 Blizzard has released a decent new wallpaper of Arthas. Unless these are taken down soon, which however unlikely (could) happen. The last gate in Sunwell has been opened, and Kil'jaeden is now reachable on all servers. Expect news of the latest world first kills to show up on MMOC soon. Two polls closed, DPS, heal or other? So, the majority of the blog readers are DPS (rogues, n all eh?) much as expected also when you look at raid balance. At least half the raid will contain DPS of some sort, while the other half will consist of 2-3 tanks and healers. I compressed the single votes into the "other" category to keep the list small. AOL, Burntmail and "other free webmail" only had a single vote each. Gmail turns out to be the biggest contender, followed by Microsoft's hotmail / live mail, then yahoo. This in turn gives reason to suspect why Microsoft would be interested in buying Yahoo as a whole and not just their search functions. A new poll has been added, be sure to add your vote! Are you planning to make a Death Knight?